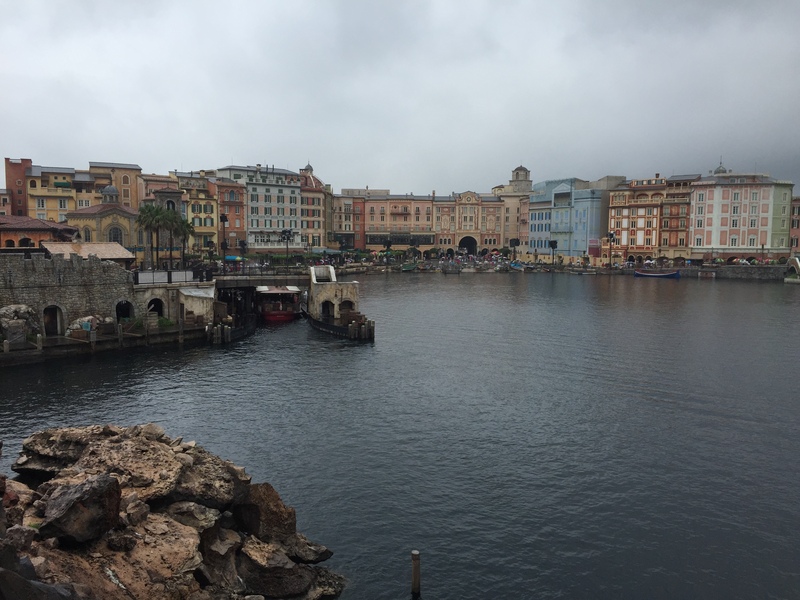 Staying overnight INSIDE a Disney theme park is a bucket list item for many Disney fans and at the Hotel Mira Costa in Tokyo DisneySea it is a dream come true! The facade of the hotel seamlessly fits in to the ambiance of the resort and rooms overlook both the interior and exterior of Tokyo DisneySea. The main entrance for Hotel Mira Costa is located outside the theme park but guests of the hotel can access Tokyo DisneySea directly from Mediterranean Harbor. The rooms are not outstanding in and of themselves. They are quaintly adorned but smaller by far than those at Tokyo Disneyland Hotel (TDH). The beds are small and each room typically sleeps three (two in the beds and one in a trundle bed). The restrooms are typically Western-style with a traditional bathtub / shower instead of a literal “bath room” like they have at TDH. Use of the hotel pool and spa costs about $30 per adult and $15 per child for two days in addition to what you’re already paying! But if you’re staying here, odds are you are doing it for the location. Staying inside a theme park with your own private access is a pretty nice perk. Oceano, the hotel’s buffet-style restaurant serves a nice variety of food. Many dishes to choose from so make sure to scope out all of your options first. Not quite as luxurious or spacious as the Sherwood Forest over at TDH, but it does offer something unique – balcony viewing of Fantasmic! If you’re having dinner while the show begins, you can step out onto the balcony to view it. It’s not a large viewing space and can get pretty crowded, but it’s a great option for adults wanting to cap off their meal with a show. Not the most ideal viewing for children as the views can be obstructed by the balcony and other people. There are also two other eating locations – Silk Road Garden serving Chinese food and Bella Vista Lounge but we didn’t try either of them. Like TDH, there are some nice benefits to staying at the Hotel Mira Costa. Free access to the Disney Resort Line (monorail transportation to the different parks and hotels), baggage delivery from the terminal, packages delivered from the parks to your room just to name a few. Purchasing tickets from the hotel grants you park hopper access from the 1st day of your stay (which is different if you purchase tickets in advance). And of course like TDH you also have Happy 15 access – a 15-minute early entry window before the rest of the crowds enter. A huge benefit! (To use Happy 15, you must go to the front of the park instead of using the special park entrance just FYI). They have a wonderful gift shop called MickeyAngelo Gifts and sell not only park souvenirs, but exclusive merchandise only available at the hotel. Overall, Hotel Mira Costa is a beautiful place with beautiful views and a location that can’t be beat. The restaurants are pricey but you get high quality food and the service is excellent. Personally, I enjoyed the Tokyo Disneyland Hotel even more but that’s sort of like saying I like New England Clam Chowder more than Manhattan Clam Chowder. Both are great, but it just depends on what you’re looking for in a hotel. But for the chance to stay INSIDE a Disney theme park, it’s quite spectacular. Curious about meals and snacks at the parks? Wondering about the Tokyo Disneyland Hotel?